The line-powered 827 pH lab is a reliable instrument that has been specifically designed for routine laboratory work. The instrument is integrated with sophisticated electronics, and a metal stand rod is fixed to the base plate, thus providing stable and reliable measured values in every respect. The measurement precision remains completely unaffected. The 827 pH lab features either the Unitrode or the Primatrode. The Primatrod equipped with NTC temperature sensor (6.0228.010) is particularly suitable for good laboratory practice (GLP) conforming pH measurements in clear aqueous solutions. The Unitrode with Pt1000 (6.0258.600) is meant for general purposes. Its fixed ground-joint diaphragm makes it resistant to contamination. 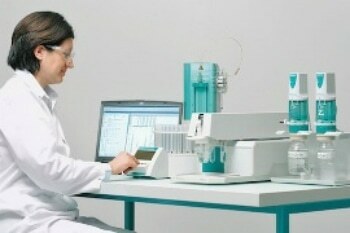 The 827 laboratory device shares the same functional range as the 826 pH mobile. Connections are provided for measuring temperature sensor, electrode, and reference electrode. The device comes standard with an external power supply providing 6V (DC). This is connected to 6V mains connection. It includes two batteries (type LR6/AA/AM3, 1.5 V) for correct time and date, and also for turning on the instrument. The batteries should be replaced after five years to prevent leakage issues. The instrument also reminds users to change the batteries by displaying the "battery low" message and symbol.